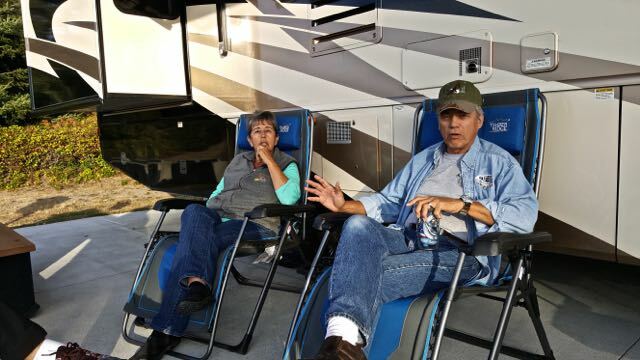 Our friends Gloria and Jim whom we met last year at McChord AFB RV Park arrived today for 4 nights. 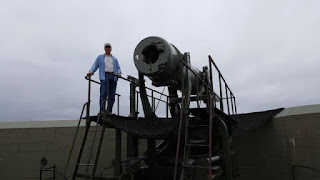 This is our 4th visit with them..previously at Travis AFB, Shields NAVY Base in Gulfport MS. 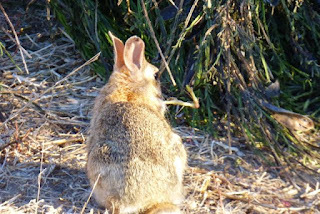 Wish they could stay longer and the weather was sunny and not so much rain, although the area sure needs the moisture. 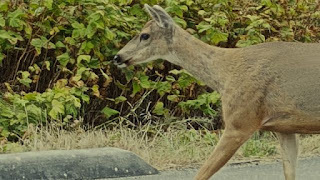 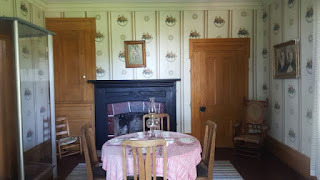 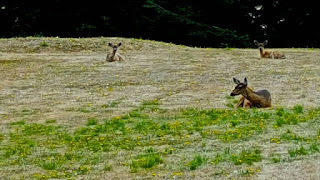 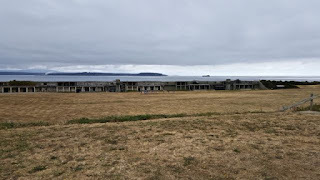 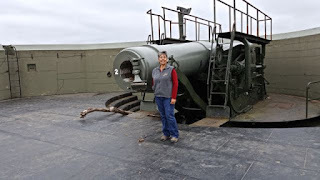 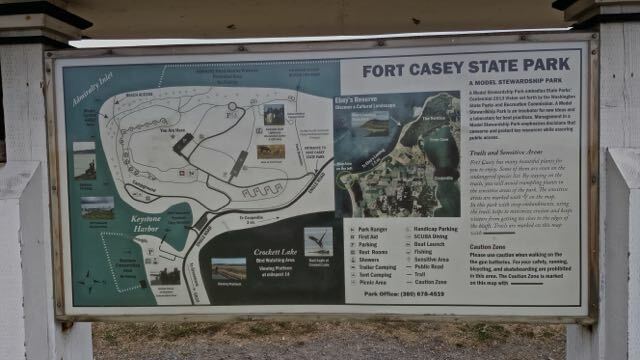 Today, in spite of cloudy weather, we drove down to Fort Casey and then took the ferry over to Port Townsend to have lunch and do a drive around Fort Worden and the campground. 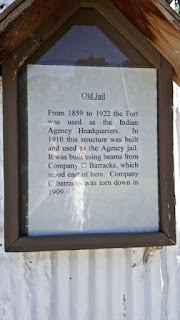 Both forts John and I have visited at least 5 or 6 times in the past. 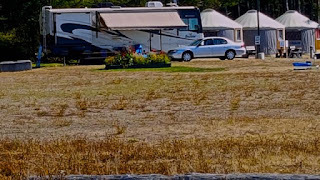 We have stayed in the campground which is very nice. 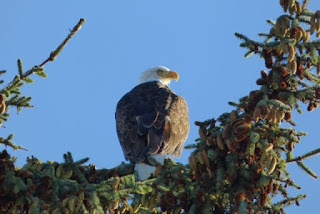 Tomorrow we want to view their Alaska photos..maybe this will spike John's interest in a trip up there. 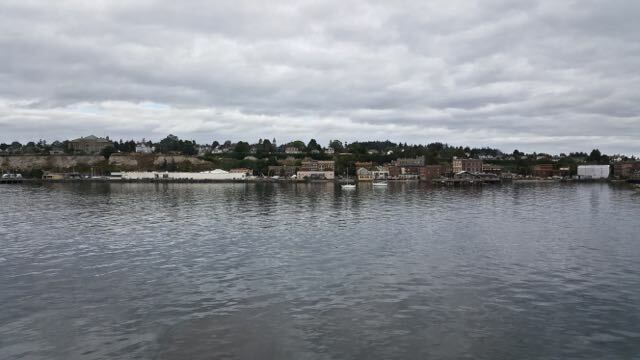 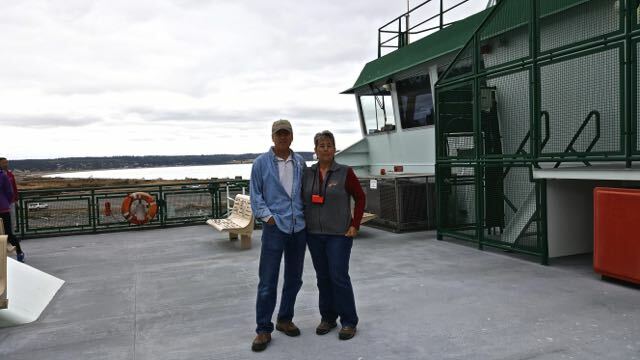 Had the weather been nice, we would have taken them over to Orcas Island for a day of touring. 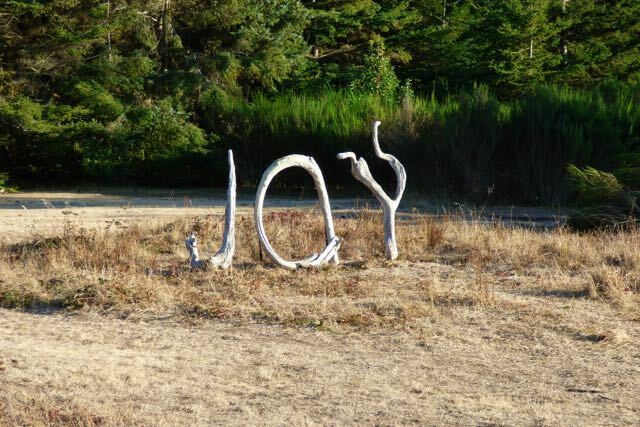 Now you have reason to return. Safe and fun travels my friends..
Our drive today down IH 90 to 405 and exit 30 to Hwy 20 and our home for the next 3 weeks, Whidbey Island Naval Air Station (Cliffside RV Park). 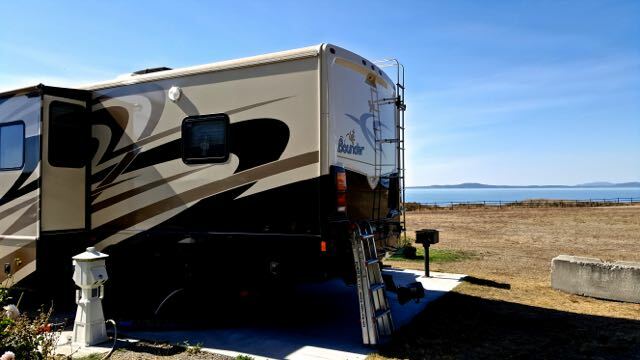 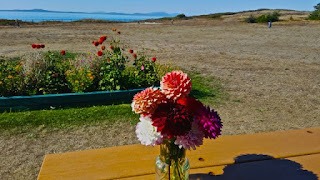 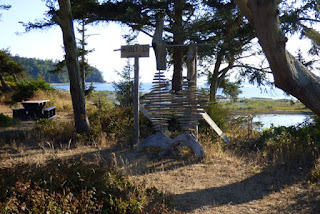 This is our 4th stay and one of our favorite campgrounds overlooking Juan de Fuca and San Juan Islands. 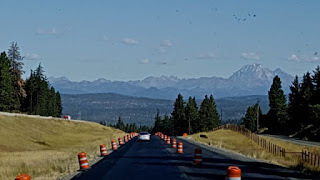 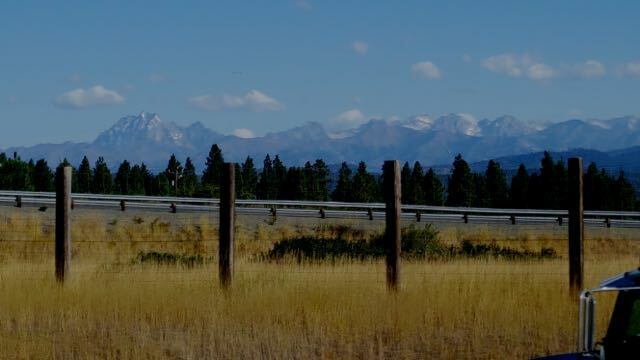 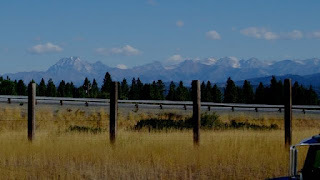 Our drive on 90 afforded beautiful views of the Cascades and over the Snoqualmie Pass. When we exited onto 405, there was a collision at the 70th Avenue exit which caused a delay of over 1 hour at 5 miles per hour for almost 30 miles. 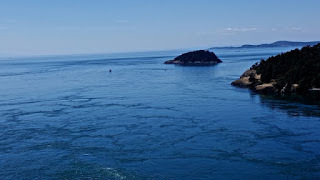 Driving down Hwy 20 to the base and over Deception Pass is a very scenic drive especially over the DeceptionPass bridge and past Pass Lake. 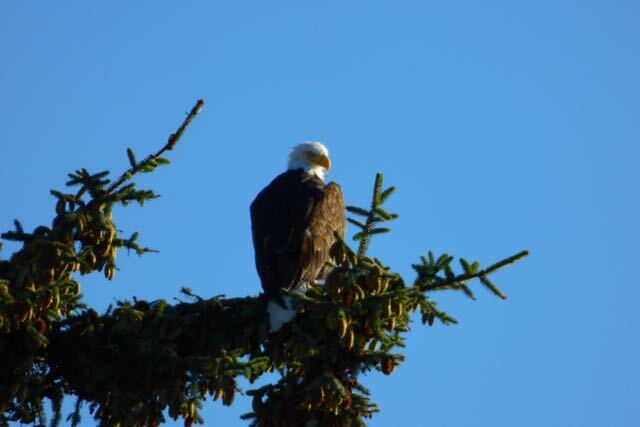 After arriving, took a walk to view the eagles. 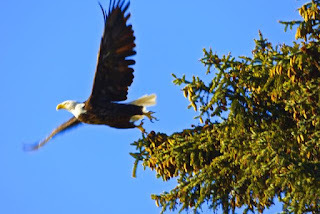 Below are the best photos..the one in flight, John took. 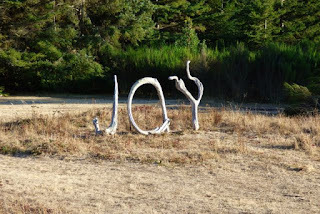 The campground has many flower gardens and cute signs made from driftwood. Ken and Diane, you are great hosts. 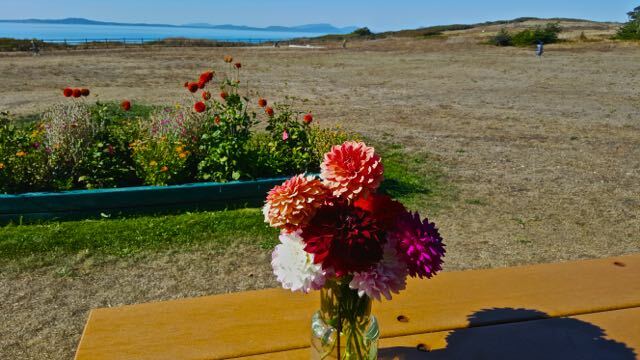 Where else can you get complimentary flower arrangements for your table from the campground garden? 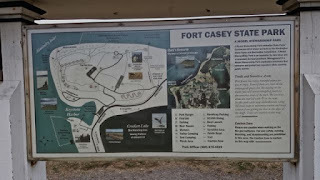 To all our military friends who have not camped here, you are missing a great experience and location. 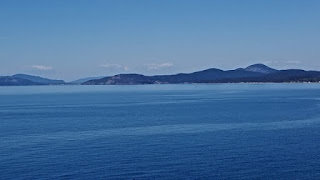 So relaxing to view the Juan de Fuca and islands. 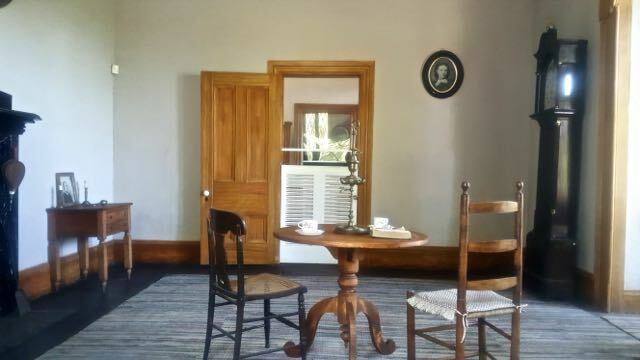 Our stay here will be mostly one of relaxation and catching up. We may go over to the islands one day. 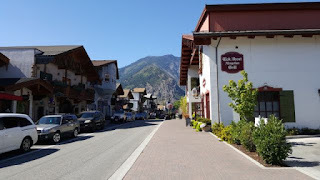 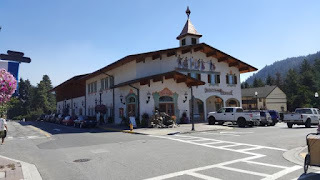 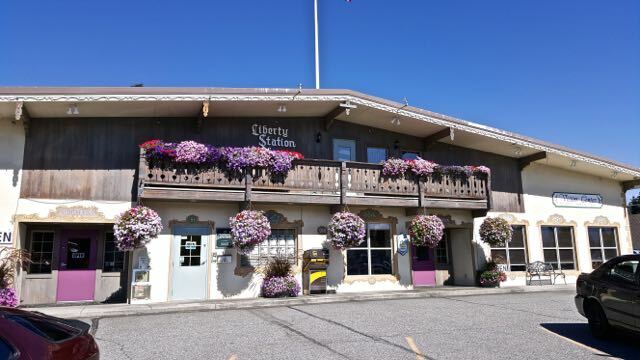 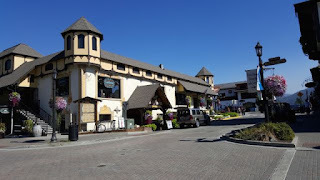 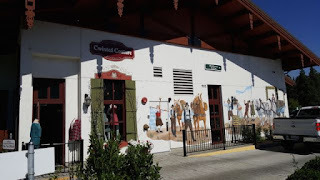 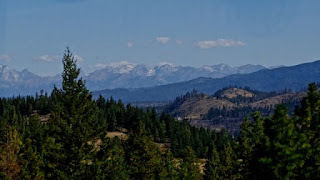 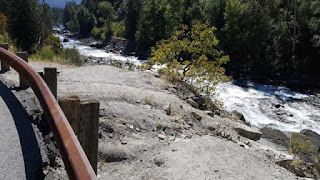 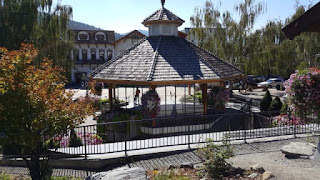 I have always wanted to visit the town of Leavenworth,WA so today we drove the 50 miles up Hwy 97 to Hwy 2 through the Wenatchee National Forest. 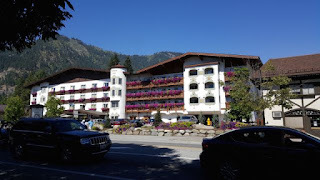 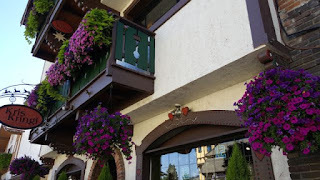 Leavenworth is a Bavarian Village located at the base of the Cascade Mountains on Hwy 2. 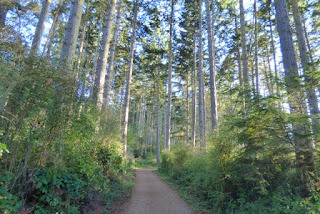 In the early 1800's, the area was inhabited by Native Americans. 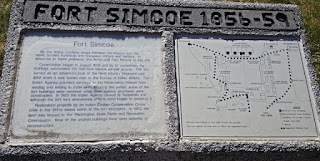 In 1892, the Great Northern Railway began laying track. 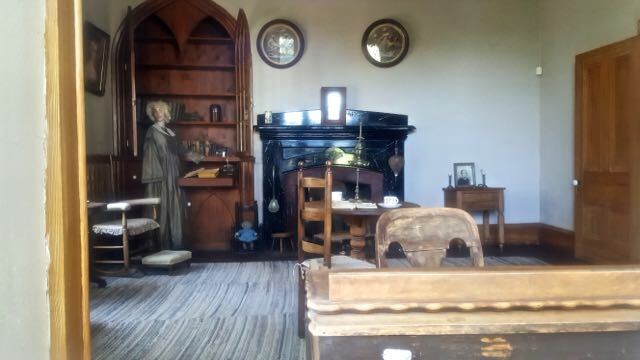 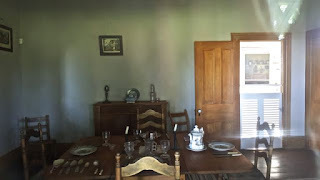 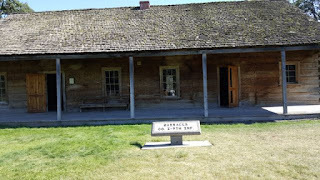 The town consisted of a P ost Office, Drugstore,Hotel and Saloon. 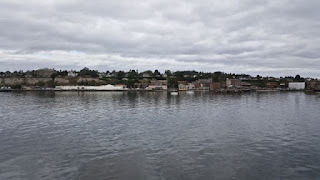 In 1904, a huge lumber settlement took hold, but not for long as the rail line was routed up the Chumstick Valley thus closing the lumber mill in 1920. 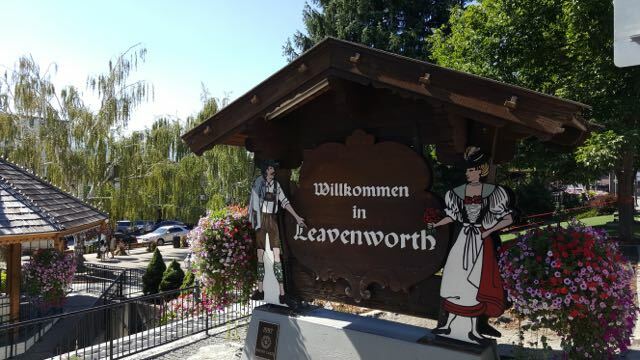 In the 1960's a project"Life--Leavenworth Improvement for Everybody began. 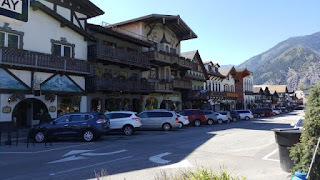 Thus the Bavarian Village was created. 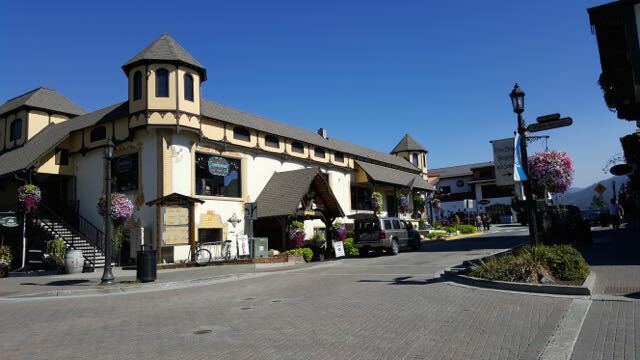 Today Leavenworth holds four seasons of adventure and seasons to be enjoyed year round. 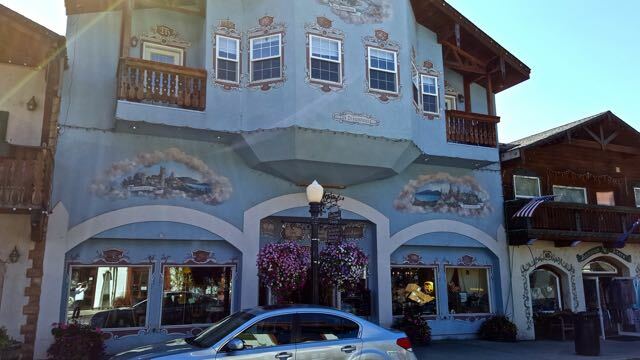 Strolling along the streets one can partake of world class food, wine and beer. 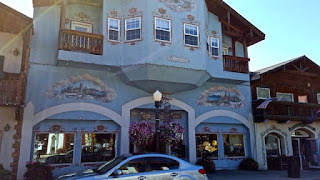 Shopping is abundant and hotels very charming. You certainly feel as if you are a German Bavarian village in Europe. 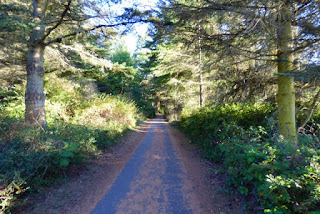 Many outdoor activities abound for every interest year round. 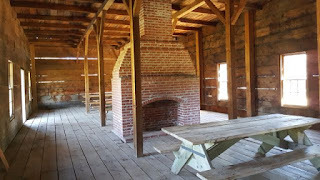 Can just imagine the beauty of the area in fall and winter. The Wenatchee River and Icicle Creek offer rafting. 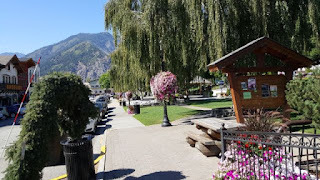 After leaving here we intended to drive up to Lake Chelan, but the smoke from recent forest fire gave cause to put on our list for another time. Instead we drove through Wenatchee and down to Othello where John had been stationed in the early 60's at an Air Force Station. 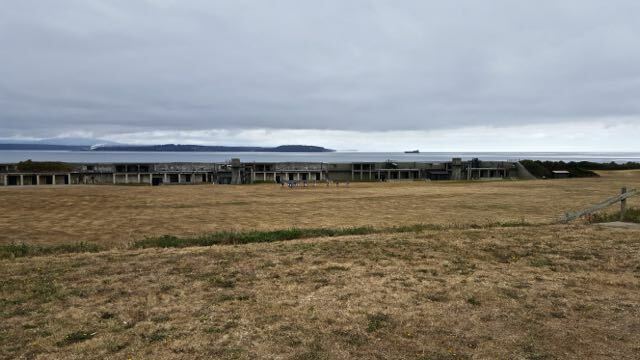 There is no access now and the base is in deterioration. 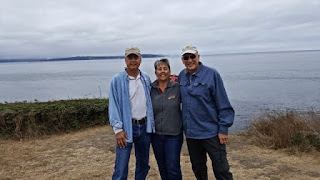 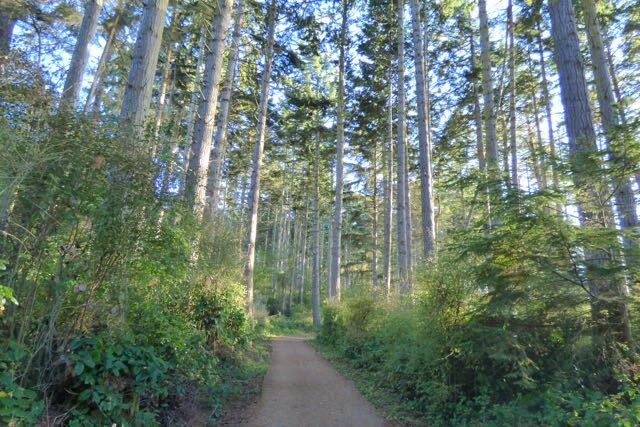 Tomorrow we are just going to relax and get ready for our departure to Naval Air Station on Whidbey Island, WA..one of our favorite campgrounds..can't wait..we are supposed to meet up with friends Jim and Gloria. 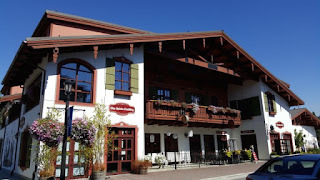 We will be there until 15 September. 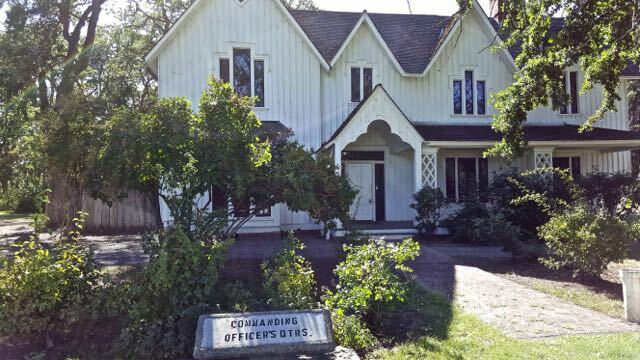 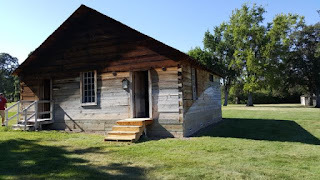 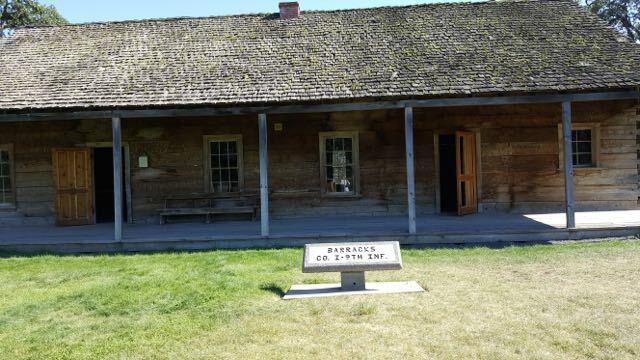 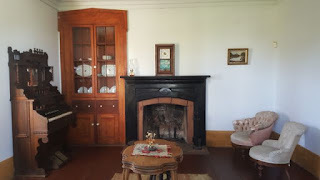 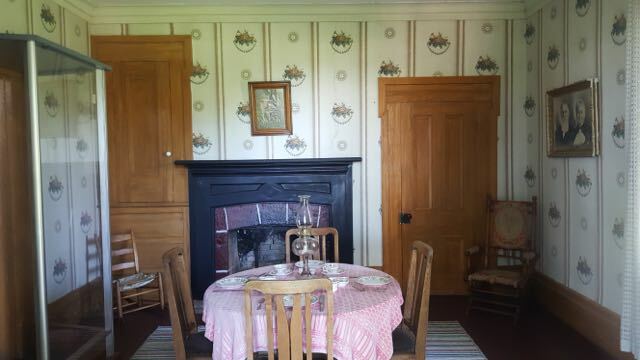 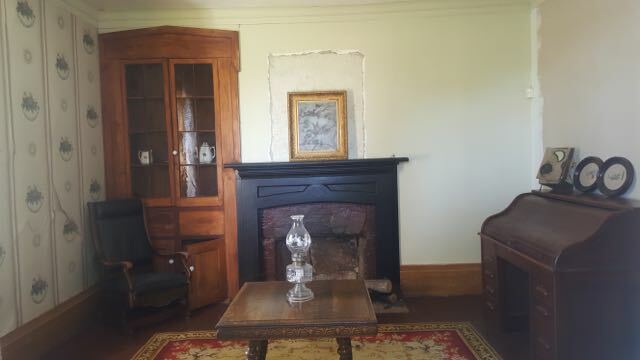 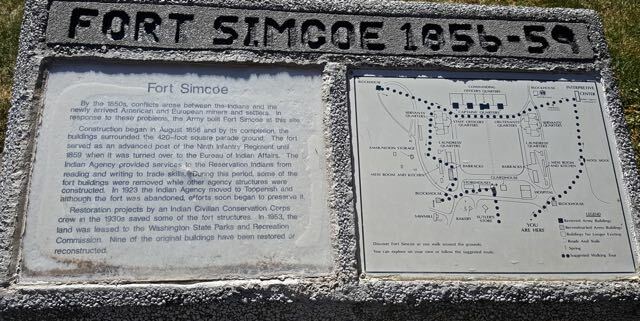 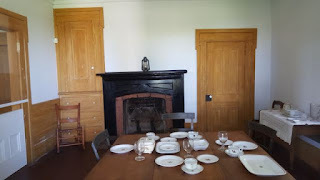 After settling in we drove some 50 miles to Fort Simcoe in White Swan, WA. 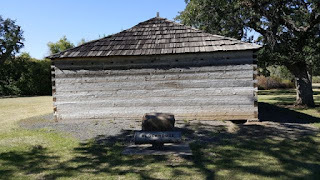 The fort was erected in 1856 to keep watch over the Native American tribes in the south-central part of Washington. Some of the structures are original and others reconstructed. 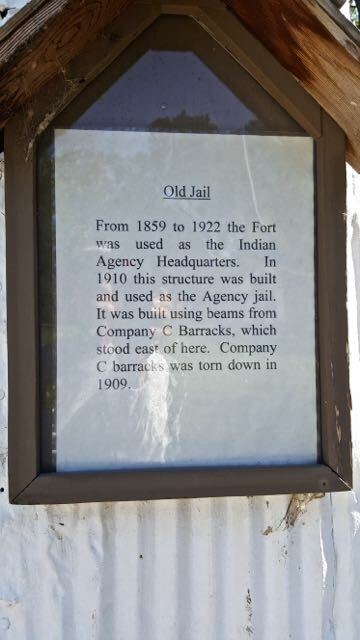 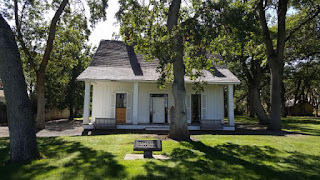 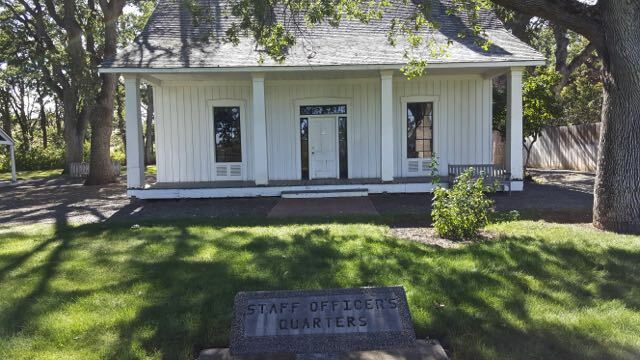 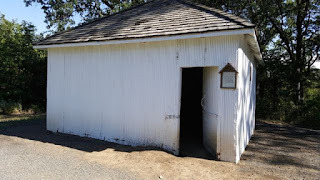 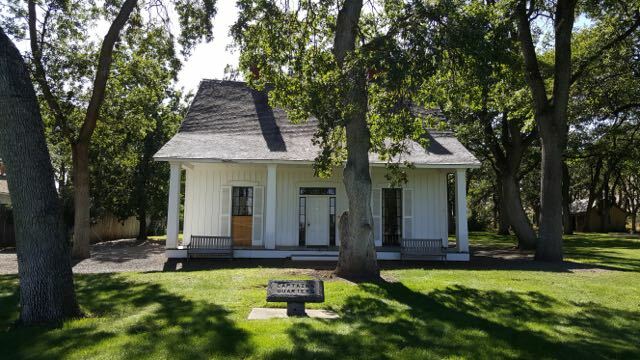 In 1859 the military turned the fort over to the Yakama Indian Agency which used it as an Indian school. 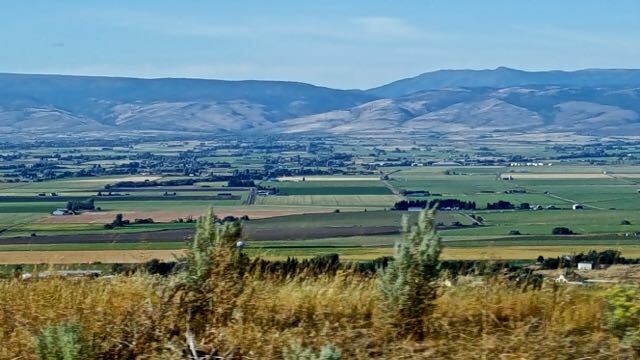 Note: the spelling when referring to the tribe is Yakama and Yakima in other references. 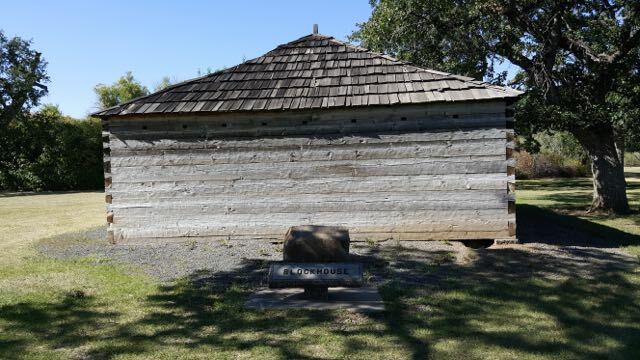 Many of the original structures only have stone plaques showing location. 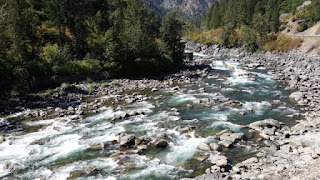 I must say this is in a remote area off Hwy 97 to the west on the Yakama Reservation. 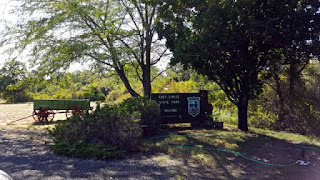 The park sits on 200 acres and is a day use park. 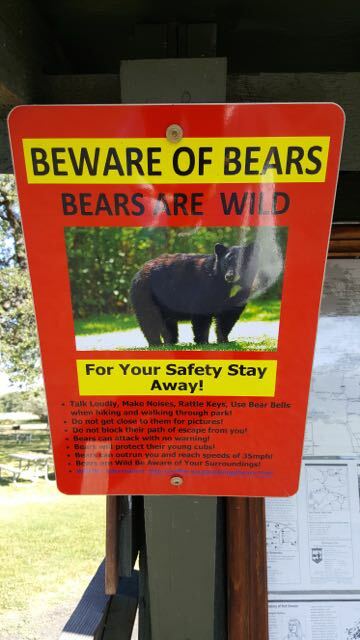 Bear warning signs posted, but no sightings. Hard to believe bears frequent such a remote and barren area..even though there are trees in the park. 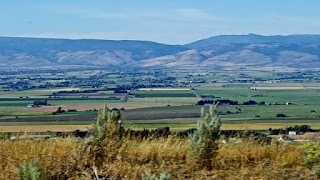 On the drive back to Ellensburg on Hwy 82, got a good picture of the valley.